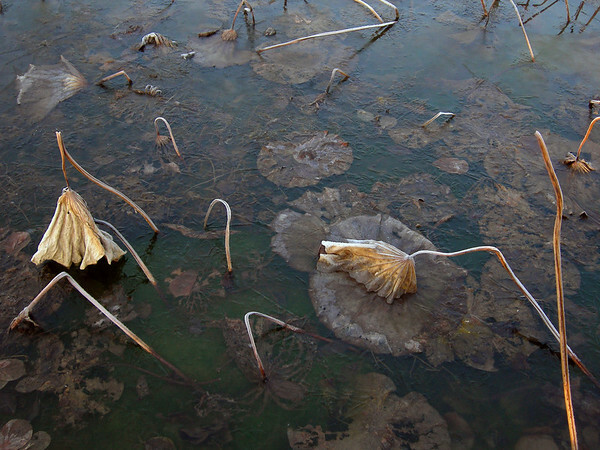 Sunday Photo; frozen lotus pond at GwanChok Temple – Wake Up and Laugh! Awakening is likened to a lotus rising from the muddy waters, flowering in consciousness. I’d never really considered, though, where does the mud come from? And, as your image shows, lotus leaves and flowers return to the water and mud in the end. Perhaps the lotus returns to the water and the mud as one’s mind returns to become a part of the whole. Everything has always been one, it’s humans who compartmentalize the world into mud and flowers. I guess that’s what the buddha would say?